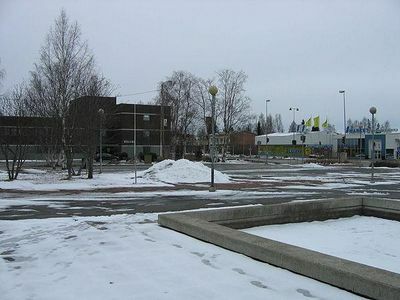 It is located in the province of Oulu half an hour's drive on route 22 from the city of Oulu, the capital of Northern Finland, and is part of the Northern Ostrobothnia region. The municipality has a population of 8,967 and covers an area of 797.26 square kilometres of which 13.78 km2 is water. The population density is 11.44 inhabitants per square kilometre . The river Oulujoki flows through the town and its countryside with the wide open plains of Pohjanmaa on the south side of the river and the forested hills of Kainuu on the northern side. Located in Muhos is the Pyhäkoski hydro-electric power plant which was commissioned in 1949 and has the highest fall in Finland . The power station has been designed by renowned Finnish architect Aarne Ervi. The town has a culture centre which consists of the town library and space for various cultural activities which can be rented for a nominal fee. The culture centre also has a movie theater.